Minimalism, what’s your understanding of it? Our world has become full of choices, it starts from our wardrobe, what to wear for an office, college or a party. The choice for what mobile phone to buy, what app to download to what furniture to buy etc. etc. and the list is endless these choices have not made our life simpler instead much more difficult and consume lots of our time. Do we think we have a solution to avoid these distractions and focus our minds on the stuff which matters the most? Must Read: How to write a humorous speech. Well said by someone that things are made to be used and people to be loved. Lesser the things we have, more the scope of loving people and the dreams you are living for. It also gives us scope to have few but the best items that we need for living. 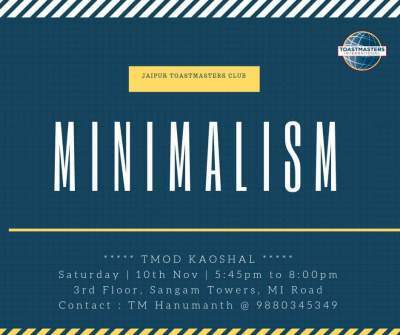 This Saturday, Jaipur toastmasters club and TMOD Kaushal invite you to be a part of the meeting with the theme – Minimalism. Be a part of achieving minimalism by decluttering unnecessary and excess stuff in your life so you can focus on life’s most important “things” health, relationships, passion, growth, and contributions. It’s an opportunity to be the best version of yourself. So let’s say goodbye to extra baggage of life this Saturday at Jaipur Toastmasters club.